Mama Kat’s not only has me thinking this week but dying to shop. The writing prompt that I chose this week is “Your top ten Fall Fashion favourites”. You see, not only am I a serial, inappropriate laugher but I am also a bit of a clothes horse. Ok, more than a bit…I was the teenager that poured over copies of Elle and Vogue and thought Karl Lagerfeld’s muse Ines de la Fressange was the best role model a girl could have. I would (I’m trying to be reformed) blow a paycheque (yes, I worked in the CHINA department of “The Bay” which was so tortuous that I must have really wanted those clothes) on a gorgeous pair of Ralph Lauren pants when I really should have been socking it away for a rainy day/marriage. I’m a devout bargain shopper now but I like to keep pieces for a long time so I tend to shop for quality. You see, I have this thing about looking tatty. I can’t stand loose threads, faded shoes, scruffs, old purses. They ruin my day. I don’t mind care about these unruly bits on other people. Honestly, I don’t even notice. But give me a run in a stocking, a button hanging WHATEVER and I get a bit crusty. Which brings me to my closet. I’m not even going to show a picture it is that bad. What I would really like is the closet here but with the house still in renovation limbo I’m housing things in there that wouldn’t normally be found. That’s my excuse and I’m sticking to it. Hold onto your hats here comes another justification. Living in a country that gets four, very distinct seasons I admittedly have several different wardrobes that cycle through. PLUS I work at a job (teacher) where I have to look fairly conservative (you’ll see in a minute that I barely fall into this category), am a mom but don’t want to look ‘Mommy’ because I like to still make myself think that I’m cool and I’m a former punk from way back. My hair has been every colour from purple to bright orange, old habits die hard. I’m going to give myself bonus points too as I just got a pretty radical haircut going from this to what I have below. Still not quite sure. Each year, I seem to pick a ‘uniform’ of sorts each year. It’s a kind of theme that I gravitate towards in hopes of getting those last few, stolen moments in bed each morning. In years past I’ve done; pencil skirts and cashmere cardies, wide leg pants and prim blouses…and this year’s pick ‘the dress’. Throw on a dress with a pair of cute heals and you’re set to go. Here are a few from this week. 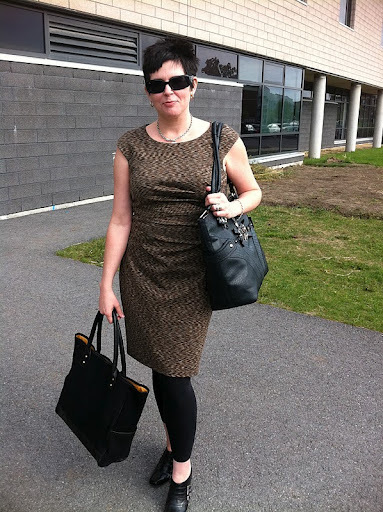 Cute, Calvin Klein dress (don’t be impressed on SALE at Winner’s), leggings (a girl’s best friend), high heels (booties, very fun) and humungous mommy purse from Guess. Apparently, must have wipes, sippy cup and snacks at all times on me. Don’t I look happy to have my photo taken? 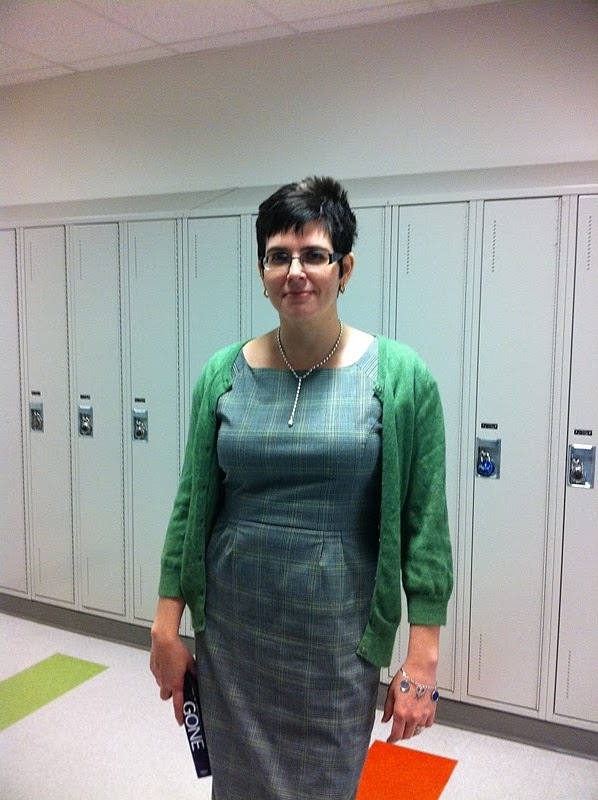 Sheath dress from Mexx (almost 10 years ago), green cashmere cardy (hello buy from high school) and sky high heels. I’ve got a meeting today and want to feel very on. Fab shoes always do this for me. Especially bad photo so it deserves to be small. This is in my school, taken by a very perplexed colleague after work. Slightly more casual day (got to run around after work on some errands so I’m at the babysitter’s picking-up the bobo) so; Max Mara, plum dress (hello, outlet), black pants from Roots (outlet), a big, wide ‘biker’s’ belt and funky, animal print sandles (I’m pushing it) from Aldo. The rest of the week includes; black pencil skirt, blue silk blouse and black cardy for parent/teacher night and for casual Friday. 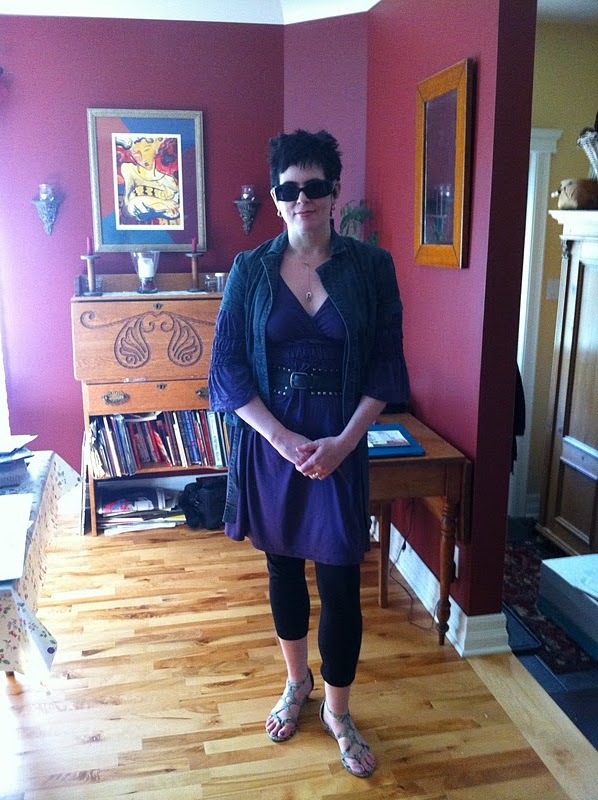 Ummm, yeah, that’s not me (I’m so totally not that thin) but imagine my surprise when Wendy at Shabby Nest pulled that picture out to design a room around this week. This is basically my “go to” casual day look 🙂 Her tailored living room looks even better. Hey, this may be the type of writing challenge I need each week to make getting dressed so quick in the morning. 🙂 This weekend I’ll also get out my bins of winter clothes, sort through and pack summer clothes. 1) This gorgeous dress from Banana Republic. I’ll pretend I’m from the cast of ‘Mad Men’. 2) Also from B.R. but don’t worry, I always wait for the sale. 3) I’m planning a trip to Kohl’s and plan to pillage Vera Wang’s Simply Vera collection. On my radar in particular , and . 4) These great pants from “The Gap”. Love wide-legged jeans for casual Fridays. 5) A new coat from Ellen Tracey that I’ve spotted at my local Winners. It’s ankle length and tan and cashmere, I’ll call her Wanda and wear her lovingly all winter long. great post Jane! Love seeing pictures of you, especially since i haven't seen you in awhile! I love your looks! It is wonderful that you have items of clothing you can pull from the back of your closet. You are one hip mama! I love the dress in your first pic at the top. And the Simply Vera pieces you've found are really nice too.Visiting from Mama Kat's! Ahh…blush. You guys are great. Not feeling too hip lately so this is a good shot in the arm.